If you're going to buy new jeans, you need an expert. Hurricane Denim, formerly Hurricane Jeans, is the Wellington Denim go to for 26 years. If you are new in Wellington, you need to know that there are few other places in this city that can rival the sheer intellectual powerhouse or depths of knowledge these guys have about jeans. Hurricane Denim has for many years been at the cutting edge of denim in New Zealand. 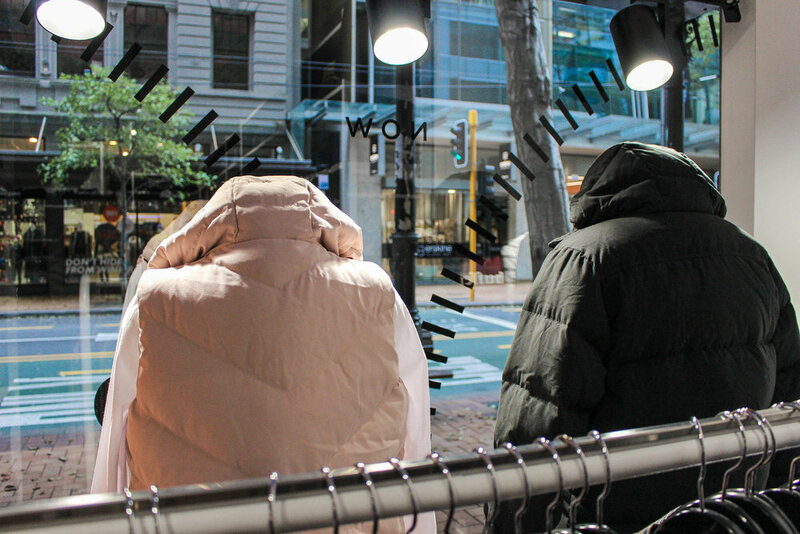 They've experimented with loads of brands which are now iconic in New Zealand, such as Huffer and Lower (which counts Hurricane as some of their first stockists). It is the eldest child of the three shops that owner and founder David Byrne runs - Miss Wong being the youngest and Fusion Surf and Skate on Cuba Street. While Dave may be a blue-jean Jedi master, he still has all the passion for his product he did as a young padawan - even when the bootleg strikes back. Now Hurricane has been re-invigorated by its move to a new location at 49 Willis Street, and a new logo by the good folk at Inject Design. "We re-looked at the retail hubs in Wellington where we should be located and decided Willis Street was perfect. The logo is the iconic lighthouse in Wellington. It is a sign of safety, a destination" Dave explains. Now Dave is ready to start his next 26 years - serving Wellingtonians up double, triple and quadruple servings of denim. Here's the basic FAQ's you should know the answers to, straight from the man himself. What brands of jeans does Hurricane Denim sell? Hurricane Denim stocks Lee, Levi's, Wrangler, Neuw, Mavi, G-Star plus many, many more. Since 1991 owner Dave's been helping Wellingtonians pick their favourite jeans. Few locals haven't been in for a pair at some stage. I for one remember buying my first pair of Lee 'Supertube' skinny jeans from Hurricane jeans, after being told to go there when I was 15 (Emo was my look du jour). Dave's knowledge of jeans is encyclopaedic. After a quarter of a century, he knows a thing or two about spotting what's hot and what's a fad. "We can be sucked into what's the trends overseas, but sometimes they just aren't for us Kiwi's - like the tapestry cuff on cropped jeans that was around, 20 years ago" he says. "We've been through coloured denim, with the reds, the greens, oranges. The Roxy jeans with paint on the bum. Red stitch. I've seen it all." He also is a big believer that 95% of people want service. "It's the same as why we go out for dinner. We want the experience and to feel happy. We do that for people. I want people going past the shop saying 'That's the place I bought my best pair of jeans'." What is a classic denim look Wellington women love? "Black high rise for women still is a staple. We have a huge number of variations on that. It is a core look. We've also seen a shift back to slim straights for all ages" Dave explains. "You can't judge someone based on what they'll end up buying. You just need to be able to listen to a person and find out what it is they need. We don't put a band-aid on the issue. It's amazing how many people say 'You got it right the first time'." What should you do to prepare before going out to go jean shopping? "Drink coffee if you're a coffee drinker," Dave says. "Eat something and be willing to communicate with the staff. They're the experts and make sure you feel confident enough to experiment with what they show you." Why do we love denim SO MUCH? It's classic, yet variable says, Dave. "I've spent half of my life selling jeans now," says Dave. "I love fabrics and seeing how you can do so much with denim. It is comfortable to wear and is a great utility product you can do so much with!" Neuw Denim. "I also like working with the guys at Levi's. They make it fun to work with them. And the guys from Lee and Wrangler. And G-Star. I'm just lucky I have good relationships with people which means that they go the extra mile for me, even though we are small." Check out Hurricane Denim's range here and check them on Facebook and Instagram.